I am composing this Fanciful blog post as I watch the snow fall on this March day. 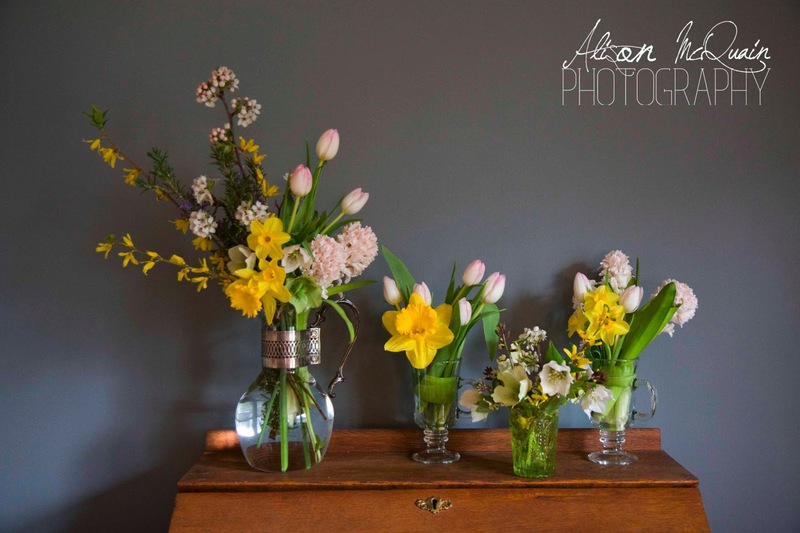 It was such a refreshing adventure arranging some spring florals on this cold gray day. The wintery weather has not made me crazy yet but the the beauty of these sweet smelling creations reminded me of the sunshine and warmer weather that is to come. I smile and walk a little lighter every time I pass these lovelies. In light of any possible Easter celebrations we thought a little floral inspiration was needed. Floralspiration if you will. Ok. so the images you see are what I started and finished with. I used to get special occasion flowers from A Village of Flowers in Nashville. They have the most unique and beautiful array of blooms on a daily basis. I have yet to find a florist in Knoxville that can hold a candle to their creativity. But, we do have a Fresh Market here. My fav splurge zone. Their flowers are surprisingly inexpensive and they always have at least one type of flower that smells just lovely. I also found a great selection at Trader Joe’s today on my lunch break. Back to my images. I am always wanting the most bang for my buck. 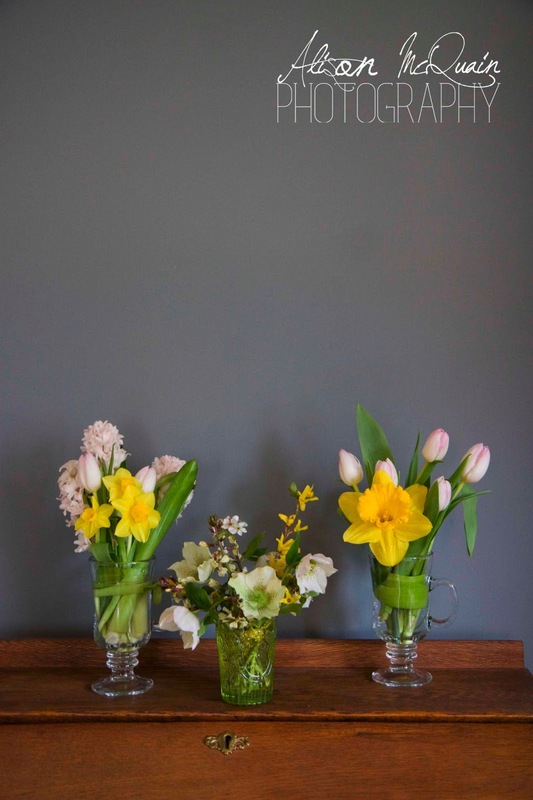 I bought some of the most fragrant hyacinths (new spelling word, had to look that up) and the prettiest little tulips. Both of these had the slightest hint of pink. They are so fresh, sweet and clean looking. I spent no more than $18 on these two bundles and was able to spread them out into 3 arrangements. I did that by adding to them with free florals from mine and my neighbor’s yard. I had a few daffodils in my yard along with some flowering arugula. My neighbor had a forsythia bush, lenten rose plant, and blooming rosemary. There was a blooming bradford pear tree behind our house that a took a few sprigs from too. 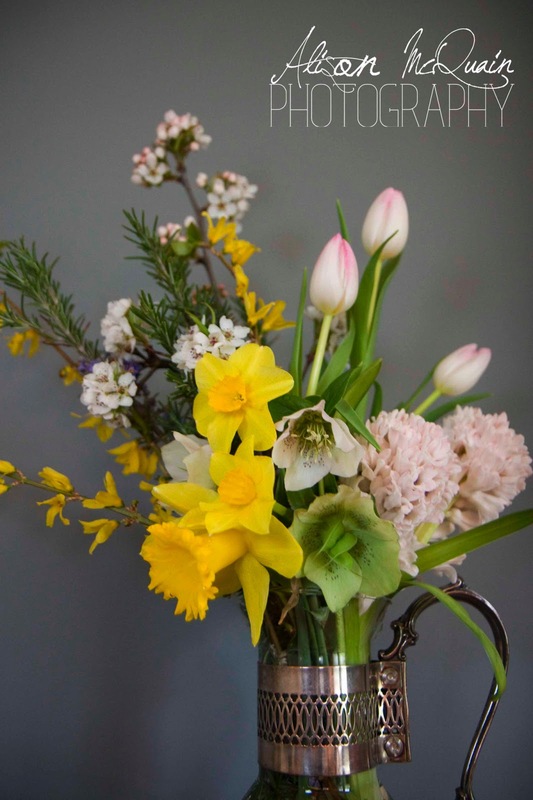 These blooms are white with a hint of pink just like the tulips and hyacinths and the forsythia adds some taller yellows to the arrangement complementing the daffodils. Bradford pear blooms do not smell good, however, the hyacinths and daffodils smell so good you can not smell those stinky little buds. The larger arrangement you see would be best viewed from one side. I don’t enjoy tall arrangements on tables where people are eating. I hate looking through flowers trying to talk to someone. I think it is best for an entry show piece. The softness of the tulips, hyacinths and daffodils is offset by the strong texture of the more branchey flowers. I love love love texture. In anything visual. My favorite paintings...the impressionistic ones with lots of paint on the canvas. Another tip, layers of flowers gives arrangements more depth and adds interest. Try not to use even numbered flowers of the same type. Arrangements tend to look more natural when you use three roses instead of two for example. I worked for a lady in the food industry once and if she ever caught you garnishing a dish with an even number of anything you would come very close to the end of your days. She was right though...a cook and floral designer, she knew the value in esthetics and the appeal of odd versus even numbers. So for my smaller table-top arrangements. 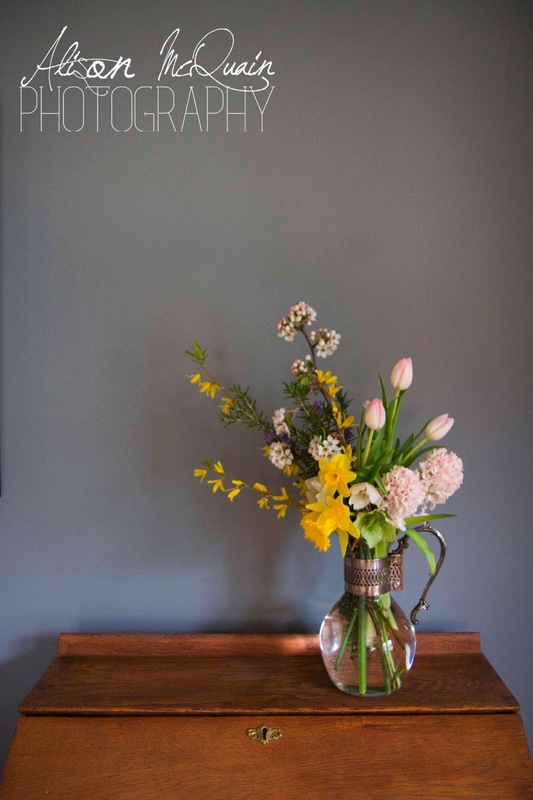 I also love simple containers filled with lots of the same types of flowers. If you are afraid of “arranging,” this is the route for you. Just buy two or three bundles of your favorite flowers, same or different colors, get some simple containers of similar style but varying height, and cut your flowers all the same length and pack them in tight. I altered this idea just a bit for my table-top flowers. I hope this helps cultivate your own ideas when you decide to adorn your home or office. Happy Spring Fanciful people! May the warmer days come soon so our flowers grow! Ali! These arrangements are gorgeous. You are quite the artist.